Anatoly Moskvin hit the news in 2011, for a rather bizarre and disturbing set of criminal charges. He was arrested in connection with a series of grave desecration events in Nizhny Novgorod, Russia. Moskvin’s occupation was as a local historian and cemetery explorer. He is said to speak 13 languages and described as a ‘genius’ but it seems he had something odd in his home. His house contained 29 life-sized dolls made from various female corpses in mummified states. The dolls were brightly dressed and their faces and limbs were covered in cloth. At the point the details were released it was not clear is each body/doll had actual remains in each one and I couldn’t see much in the way of a follow up, but the police and teams involved likely have a hard job of identifying all of them. In the flat the investigators found the photographs and nameplate taken from headstones, instruction for making dolls and maps of cemeteries in the region. Shoes found in his home matched footprints found in the cemeteries and it is reported that he singled out Muslim Graves. Lonely? Disturbed? Moskvin was caught out and no doubt this bizarre story will yield more details in the future but for now it is a curious psychological piece, what was he aiming at in the end if anything at all? There we go a creepy tea break read! An unsolved case from 1950, Paradis, Louisiana in the United States centred around 18 year old Jacquelyn Cadow. She heard wolf whistles outside her bedroom at night, starting in February that year, the home she shared with her mother also suffered an intruder and the incidents were reported to the police but nothing ever came of it. Cadow would hear the whistles nightly and then they changed to a funeral dirge when she announced her engagement to Herbert Belsom, a State Trooper. Instead of deterring the stranger this escalated the situation and Cadow began to suffer a series of threatening calls. The voice threatened to come to her house and stick a knife in her should she wed Belsom. Her sleep was continuously disturbed by whistling dirges and blood curdling moans. The local newspapers picked up her story and hundreds of curiosity seekers would pass by to try and catch a sight of the Whistler. I feel quite sure this would not have helped Cadow’s nerves. She finally suffered a collapse when she, her mother and a New Orleans States-Item reporter heard the phantom whistler whilst she was at work. The reporter and Belsom both searched the yard and could find no one. Again State Police investigations could not turn up anything or anyone to assist in resolving it for her. With shattered nerves the young woman went to stay with her relatives and the stranger followed. When she went to Belsom’s parents the whistler phones her mother back up “tell Jackie I know she’s at Herbert’s house”. 1st October 1950, despite the threats and harassment Cadow and Belsom married, the whistler? He was no where to be found and the events came to a halt. With no more information or threats the Sheriff finally closed the case. I see this one a lot when I am looking for interesting tales, D B Cooper seems to be quite an adventurous tale and so I have included him here. In 1971 he hijacked an airliner and threatened to blow it up, he extorted $200,000 from the owner, Northwest Orient, and then leapt from the airborne 747 with 21 lbs worth of $20 bills strapped to his torso. The fact he has never been caught means he either pulled off the perfect crime or died trying. Either way he makes for a fantastic story! And one for armchair enthusiasts to really get their teeth into, with pages of information and lots of speculation. Perhaps what I love most about this, no bystanders were injured although law enforcement argues that he did put several dozen lives at risk. The FBI’s ego was probably pretty damaged though, and not long after he had disappeared FBI Director, J Edgar Hoover, died knowing that they had not yet got their man. His crime seemed to help with things like passenger security screening and other regulations to try and prevent further troubles but ultimately he was able to walk around the jet carrying a bomb. For some reason this chap just incites smiles rather than outrage, most likely because of the buccaneer type style under which this crazy stunt was performed. 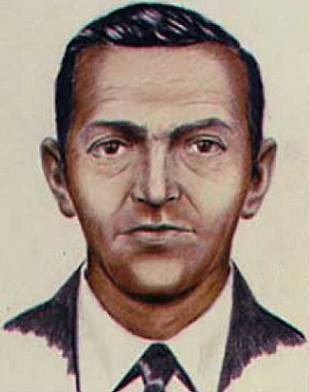 Flight 305 was a Boeing 747 that started the day before in Washington DC for its flight path, DB cooper boarded at the Portland International Airport with a ticket to Seattle-Tacoma and gave them the name Dan Cooper. He was nondescript and no one took particular notice of him, again this all went in his favour. Moments after the jet was airborn he passed a note to Flo Schaffner, as an air hostess she was used to come ons and pocketed it. He then waited until she passed and whispered to her she should read it, he had a bomb. Her and another attendant, Tina Mucklow, then went to the Captain and told him about the whole thing. The FBU placed a call to the Donald Nyrop, the president of Northwest Orient, they complied with the monetary demand, probably as it was a smaller price to pay than the disaster and media fall out that could have occurred. The precise wording of his note cannot be found as it was lost, he said he wanted it back and took it with him, there was an agreement it had something like ‘no funny business’ on it however. Cooper told Schaffner that he was to stay aloft until the money and chutes were ready in Seattle, he showed her wire and cylinders that might have been dynamite and she dutifully relayed the message. Captain Scott told passengers it was a mechanical problem and they had to circle around before landing, all but a few passengers were aware of the situation. He had calculated how they had to be weighted so they were hoping that he would make his skydive safely on that basis. The notes were hurriedly copied on to microfilm to try and make a way to track them and he wanted two chutes. They got what he demanded and then aboard the jet Cooper had a bourbon and water, he then oddly offered to pay for it! Mucklow said his behaviour was curious, that he was not cruel or nasty and seemed very calm. The FBI however said he was boozy, raunchy and obscene compared to the person that was with him most. Mucklow said it was not the case and she said that he requested the meals for the crew be brought on board once the place was on the ground in Seattle. Cooper seemed to be at least familiar with Seattle and was well acquainted with skydiving and schooling in jet aerodynamics. With cash and parachutes ready they were able to land just 30 minutes behind schedule. Captain Scott was sent to get the money and chutes, the 36 passengers and Schaffner were allowed to disembark but he kept Tina Mucklow, and the three men from the cockpit. Through the Captain and FAA official asked to come aboard, presumably to tell him the consequences of his actions but Cooper denied that request. Cooper then had those left on the plain fly up to an altitude no higher than 10,000 feet. The wing flaps set at 15 degrees and the airspeed of no more than 150 knots. He said he was wearing a wrist altimeter to monitor it. Cooper knew that the plane was capable of it, unlike larger types. Cooper ordered a full refuelling at Seattle and then they negotiated the flight plan he wanted, and Scott was told that the cabin should not be pressurised so that it would minimise the potential violent surge of air when he dropped the aft stairs. With this done they headed off… two hours and six minutes after the plane had arrived in Seattle. Somewhere around Lewis River, north of Portland, the aft stairs appeared to have been lowered, they thought he may well have jumped then but they were not going to risk their lives assuming it and flew to Reno where they were to touch down. Once they landed they gave it five minutes and left the cockpit, the hijacker was gone, even his hat and coat had been taken. The cash and one set of parachutes was also taken too. February 10th, 1980 an 8 year-old boy was digging along the sand of the Columbia River bank, he found three bundles of bills all were $20’s and matched the numbers of Coopers loot. Some say that this was the evidence of his demise, more was found deposited further up and this led to more searches, but others suggest he may have realised the numbers on the notes would be trashed and he got rid pretty fast. So far the money that hasn’t been discovered has not been used or found so there’s nothing to suggest he did get around to spending it. Whatever the end result this has been used for stories and even a comic book called Dan Cooper! If he is alive he’s in his 70’s probably and keeping the story to himself.